Germs lurk and bad habits are hard to break. When it comes to teaching proper bathroom etiquette, it's best to start early and remind, remind, remind. This week we're headed to kindergarten orientation with my daughter. One of the only reasons that I'm not really looking forward to the school year is the increased risk of colds and illnesses. This year I'm planning to make a side trip to the bathroom with my daughter on orientation day to familiarize her with the restroom and remind her of the importance of hand washing and other bathroom protocol. And, we've found the perfect book to help us remember all the rules of the bathroom. "They don't mean to be messy. They haven't got a clue. Let's meet some potty animals and tell them what to do." Potty animals. Every daycare, preschool and kindergarten teacher has seen their fair share of them. I'm sure you've even seen them yourself. Maybe even in your home. What kind of animals am I talking about? Those kids that refuse to wash their hands, flush the toilet and, time after time, display poor bathroom hygiene. Hope Vestergaard provides a humorous yet instructive book for all those little potty animals. Sycamore Preschool is full of animals that forget their bathroom manners. Wilber doesn't wash his hands, Wilma waits too long, Freddie forgets to flush and Georgie doesn't wipe. In rhyming verses, Vestergaard writes of all sorts of bathroom woes and gently provides tips on the right way to handle bathroom visits. 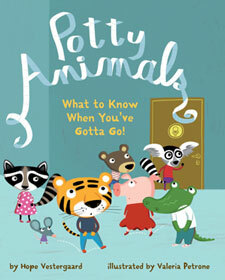 An easy and fun read aloud, the verses even prompt kids to help remind the characters of the potty rules. Hopefully when kids use the bathroom, they'll remember and try to avoid the bad behaviors of the potty animals. This is not a potty training book, but a book for kids on bathroom manners. Somehow Vestergaard manages to cover this important topic in a fun and tasteful way without sounding preachy. She's a veteran early childhood teacher so she's had plenty of experience with the subject matter. And it's pretty hard not to laugh at Petrone's bold illustrations of the cartoon animal characters as they break the rules. The poor male elephant teacher has his hands full in this zoo of a preschool! The toilet paper letters in the title on the cover are a cute, eye catching touch. My daughter just loves to look at the pictures (she likes the girl raccoon in the pink dress), and I've noticed that she doesn't rush around quite as much in the bathroom and thinks about the rules covered. Read the book to remind kids of proper bathroom etiquette and maybe they won't end up looking like they were raised in a barn. It's a perfect back-to-school read for all young children, and I highly recommend this helpful, humorous bathroom basics book. Teachers of young children will especially appreciate the book. I also printed out a train potty training chart for my son to color from childavenue.com. I'm going to start potty training him next month. Wish me luck. Sometimes potty animals can be stubborn as well as forgetful. A Mommy's Adventures hosts the "stART" meme (Story + Art) each week. Hope Is the Word hosts a Read Aloud Thursday link-up as well. Homeschool Creations hosts the weekly Preschool Corner link-up, a place to share activities for preschool and 5K. I hadn't heard about this one. I think this is a MUST for my four year old. Thanks for the great review! 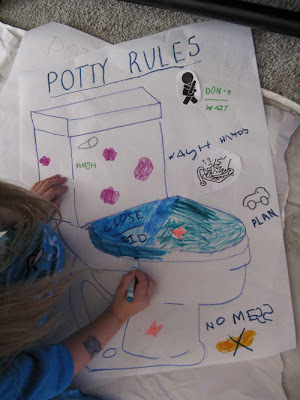 This is such a great idea to reinforce those potty rules. That book sounds so cute. Good luck with the potty training! I'm procrastinating potty training, but it's going to need to start soon. Right now I'm trying to get the 5 year old to use the restroom WITHOUT taking off all her clothes. An essential skill before she starts Kindergarten! Looks like a cute book! oooh what a fabulous book! Must check it out, will be a great way to make sure Red Ted does all the right bits! That book lokks great and something weshould read to our daughter. Thanks for ths pdf link!!! I have a couple of forgetful boys here, so I think I'll be getting this book soon. The rules idea is genius. We haven't started yet. When we do I need to this. Sounds like such a cute book- I have never heard of it! That seems like a fun (useful) book! Good luck with the potty training. We have taken a step back, because the Bibliophile is really not interested.